My husband and I lived in Arizona for a long time before we had a family. Cinco de Mayo is a big event - there are parties across the state. I loved all the bright decorations, festive music and the food. Oh my gosh, the food. I miss the incredible Mexican food from Arizona. The tacos, the guacamole, and fresh salsa - oh my! We are looking forward to having a small celebration here in our home this year. I've been contemplating what dessert would I showcase. I've been seeing all those gorgeous roll cakes on Pinterest and Instagram, thought it would be so much fun to try one out. 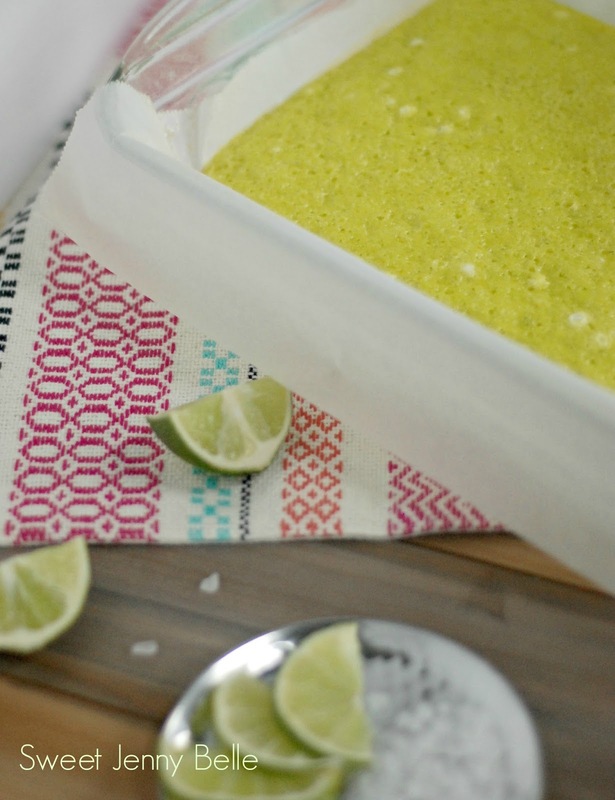 And what better flavors to add to the cake, but a bright lime margarita. 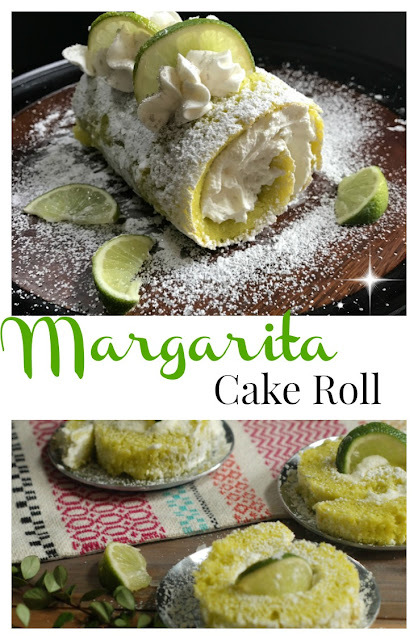 The tequila in this recipe is baked and the cake is not alcoholic, it is safe for children to eat and enjoy with you. The buttercream contains no alcohol, but if you are having a party just for adults, Sally has an amazing tasty boozy buttercream here. So why add the tequila to the cake, it is only 2 tablespoons. The tequila has a very unique flavor and it pairs incredibly well with the limes and sweet buttercream. You will find the palette of this cake is complex and delicious - I promise you that it will receive rave reviews! 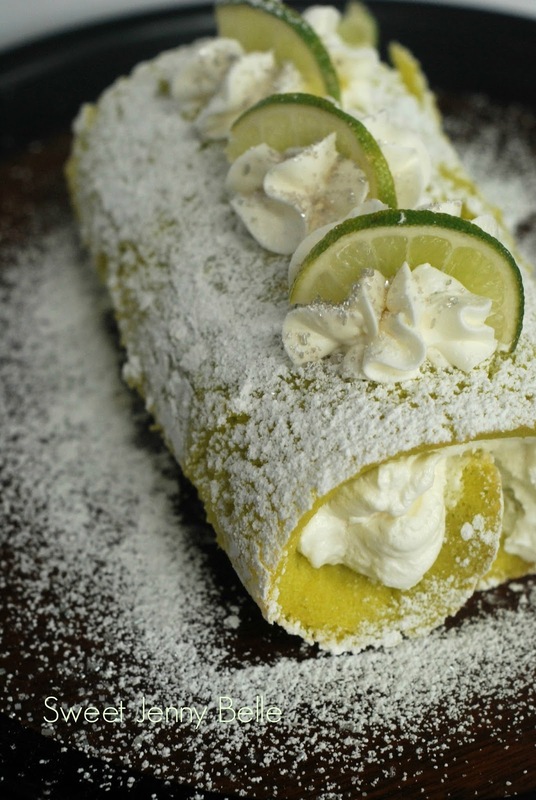 The cake roll is a pretty easy recipe, but you must be watchful to not overmix it. Combine the dough as minimally as possible. It is also important to not overbake your cake, check on it at after 10 minutes. You want it to spring back from your touch, but not crispy on the edges. Happy Cinco de Mayo! May your fiesta be long, loud and delicious. And save some cake for me. 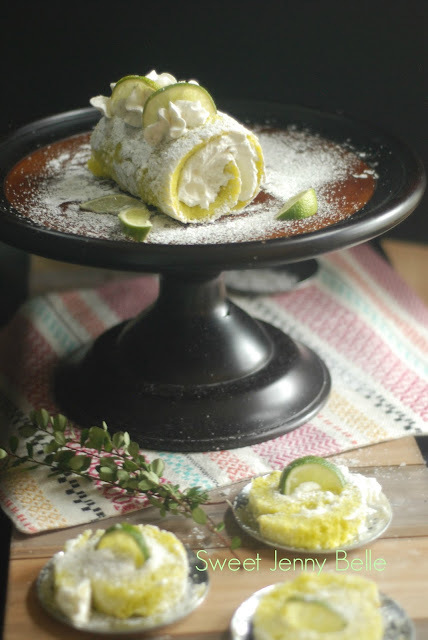 A bright and sweet cake roll perfect for your fiesta or Cinco de Mayo party. This is best served the day you create it. Preheat your oven to 350 degrees. Prepare a 9"x13" pan with a sheet of parchment and cake release spray. In your mixer with a paddle attachment, whip your eggs and sugar together until they thicken, about 4 minutes. Add tequila, lime juice, zest, vanilla and a drop of electric green gel. The green dye is not necessary, but it gives it a gorgeous color to the cake. Blend until the dough is well combined. In a separate medium bowl, sift together the flour, baking powder and salt. Gently add the egg dough and mix until combined. You don't want to overwork your dough, but be sure that is mixed together. Bake the cake for 10-12 minutes or until the center bounces back to your touch. Immediately remove the cake from the pan, but still on the parchment paper. Allow the cake to cool for 10 minutes. While it is cooling, dust another piece of parchment paper with powder sugar. Flip the cooled cake on to the sugared paper. Roll up with a clean dishtowel and cool completely. While the cake is cooling, prepare your lime buttercream. In a mixing bowl, whip together all the ingredients for 10 minutes or until it is light and fluffy. 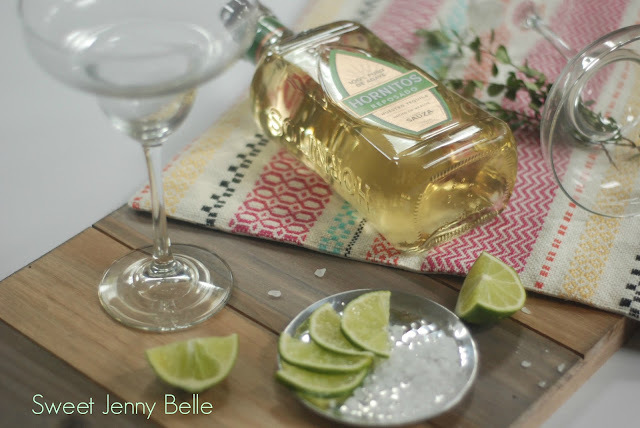 If your icing is too stiff, you can add a small bit more of lime juice. Gently unroll the cake and spread the lime buttercream out, but give yourself a 1" perimeter border. Carefully roll the cake back up and place on to your serving platter. To decorate the top, gently sift powder sugar all over the cake roll. Fill a large pastry bag of the lime buttercream with a star tip and ice a few beautiful flowers on top. 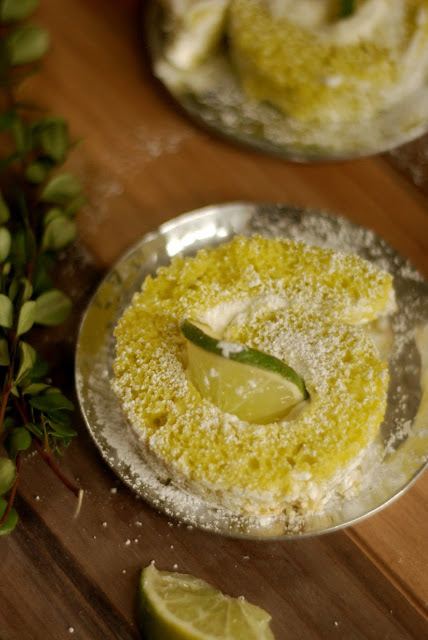 Place a thin lime slice through the buttercream flower and decorate with silver sprinkles. Are you feeling like churros instead? 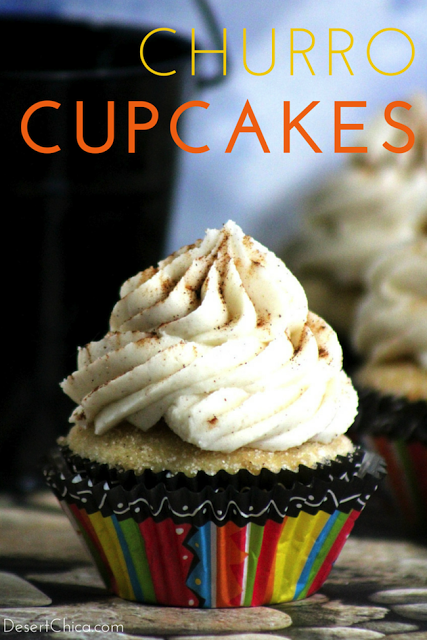 Stop by my best friend's page, Desert Chica, to read on how to create these delicious cupcakes!